When it comes to getting stronger we have obvious solutions like adding more weight or doing more reps. Funny enough, this is where people stop with their training and often miss the bigger picture of how we can progress our strength training. In fact, the late great strength training scientist, Dr. Mel Siff, pointed to the common misunderstanding of getting stronger! 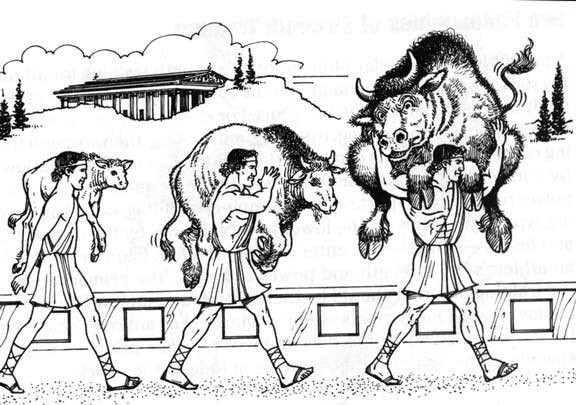 Most of us have been told of Milo the ancient Greek who in order to get stronger started lifting and carrying a calf. Once the calf got too light, he went to a larger cow, and so on. The point of the story is that to get stronger we have to lift heavier weights. That is true, to a point. What Dr. Siff explains is the flaw with this great myth of strength training…. The one that gets often TOTALLY ignored in strength training programs is the idea of planes of motion. When we move in life we move in 3 planes of motion (forward and back=sagittal, side to side=frontal, rotating=transverse). Yet, 99% of the time when we look at strength training programs they ONLY focus on sagittal plane strength. Why? Without realizing it, that is the most stable plane of motion so we can lift the most weight. This is important for beginners because we need them to gain some foundational strength and understanding of movement before we build upon their strength training programs. In order to progress though, we want to learn how to resist the other planes and then move through them. What are some examples? Our DVRT Bird Dog progressions as strength coach, Joel Gunterman, demonstrates is a great way to introduce resisting rotation to your strength training. Our lateral muscles of the body are mostly designed to resist unwanted movement from side to side. That is why resisted Arc Presses are great strength training moves to improve our ability to RESIST lateral motion. Fitness expert, Alwyn Cosgrove, shows how we can advance these concepts to build serious strength by resisting both rotation and lateral motion while moving through the sagittal plane. Once we learn how to have the stability to resist motion, then we can start moving through these different planes of motion. Why is this so important? Experts like Dr. Stuart McGill, discuss that the BIGGEST difference of functional strength training versus bodybuilding is the idea of “linkage”. Bodybuilding makes us believe that isolating a muscle and making it stronger is the way to improve our strength. Unfortunately, that isn’t how our body is designed for movement otherwise we would all move like zombies! Our body is meant to connect and when we train the muscles to “link” to the natural chains of our body, we get superior results! DVRT Master, Cory Cripe, shows how we can move through these different planes of motion and combined with resisting these planes as well. This is a MUCH higher form of strength training that leaves no muscle untrained and creates a serious metabolic response! Most of all, this is NOT about doing “cool” new exercises, but understanding how to build smarter progressions in our strength training. Knowing when and how to use these strategies makes our world of strength training so much bigger and effective. We can problem solve with much greater intent and purpose which makes our training more enjoyable and result producing. Don’t miss DVRT Master, Steve Holiner, discussing HOW to create progression in our progressions and use the variable that MOST strength training programs miss!